See more photos from the Terry Fox Run on the TASIS SmugMug page. 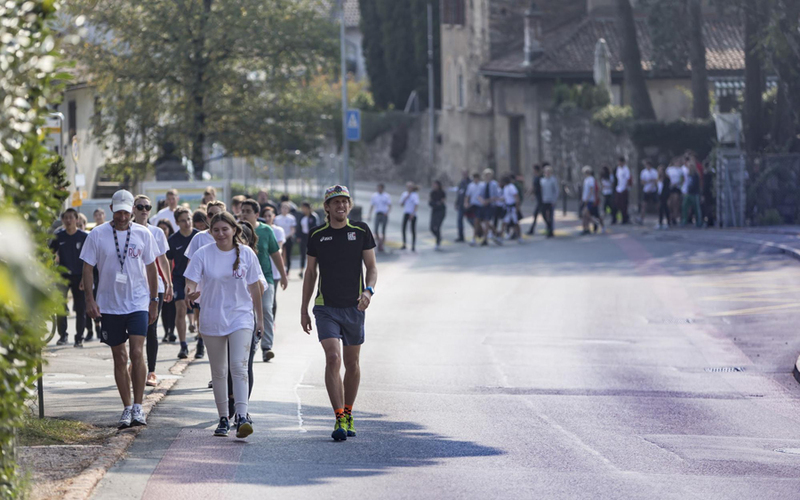 Led by Athletic Director Sonny Lim and with support from the Varsity Cross Country team, TASIS The American School in Switzerland hosted its first-annual Terry Fox Run on the afternoon of October 11. In an inspired effort to honor the legacy of international hero Terry Fox—an extraordinary athlete, humanitarian, and cancer research activist who in 1980 embarked upon a Marathon of Hope across Canada after losing his right leg to cancer three years earlier, ultimately covering 5,373 kilometers (or 127.3 marathons) in just 143 days before the spread of his cancer forced him to abandon his quest and claimed his life—Mr. Lim challenged all High School students and faculty members to complete as many 500-meter laps as possible on the School’s Grotto Cross Country course in a 45-minute window. More than 300 High School students and faculty members accepted the challenge. After gathering by the main TASIS entrance to pin their “dedication shoes” to the Terry Fox Run Dedication Wall and observe a collective moment of silence, they walked in unison—most wearing special Terry Fox Run t-shirts that Mr. Lim created for the event—down to the Grotto Course, where numerous parent volunteers were waiting to hand out rubber bands as each runner completed a lap. Fighting their way through road traffic, crowded and uneven trails in the woods, and an uphill finish to each loop, the determined runners and walkers combined to complete 3,028 laps in 45 minutes, covering a total distance of 1,514 kilometers (or 35.9 marathons). The 11th-grade advisor group of High School History and Economics Teacher Eric White earned a pizza party for being the day’s top performers, as nine students and Mr. White finished an impressive 98 laps. Rounding out the top ten were the advisor groups of Mr. Paul Diviani (grade 10, 96 laps), Mr. Paul Cawthorne (grade 9, 95 laps), Ms. Valerie Bijur Carlson (grade 10, 92 laps), Dr. Chris Love (grade 11, 92 laps), Mr. Danny Schiff (grade 9, 92 laps), Ms. Andra Yount (grade 9, 92 laps), Ms. Charlotte Zanecchia (grade 10, 92 laps), Ms. Mara Bernasconi (grade 10, 90 laps), and Mr. Mark Aeschliman (grade 9, 84 laps). Although Terry Fox, who began his Marathon of Hope in 1980 with little fanfare and the stated goal of raising one dollar from each of Canada’s 24 million citizens, was unable to complete his journey from Newfoundland’s Atlantic shores to British Columbia’s Pacific coast, his spirit and passion remain alive today. Millions of runners in more than 60 countries have now participated in the annual Terry Fox Run—the world’s largest one-day fundraiser for cancer research—and more than 650 million dollars have been raised in Terry’s name. Student filmmaker Sasha Tsenter ’19 chronicled the action.